A return to the Camino means a return to the food of the Camino, and it should be no surprise to any of you that I sometimes dream about daily café con leches. In fact, I dream about a lot of the food I ate along the way. But this wasn’t always the case. 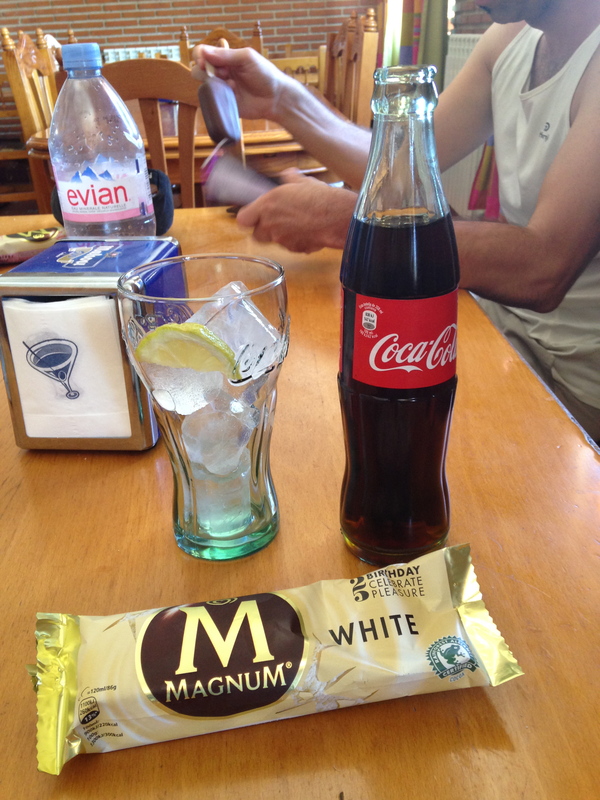 By the end of my walk on the Camino Frances, I was getting tired of the food. It happened all at once; one day, I was marveling at how I would never tire of tortilla or tuna or pilgrim’s menus with their slabs of meat, french fries and ensalada mixta (usually a very, very basic salad). By then suddenly, a few days from Santiago, I lost my appetite. Don’t get me wrong, I was hungry, but nothing seemed appealing. Maybe it was having eaten the same food for 30 days, or maybe it was being so close to the end of my pilgrimage (in those last days my body hurt and my mood was a bit off and I didn’t want to eat the foods I had been loving for weeks. My sub-conscious telling me that I didn’t want my journey to end? Or that I was ready to end? I’m still not sure). 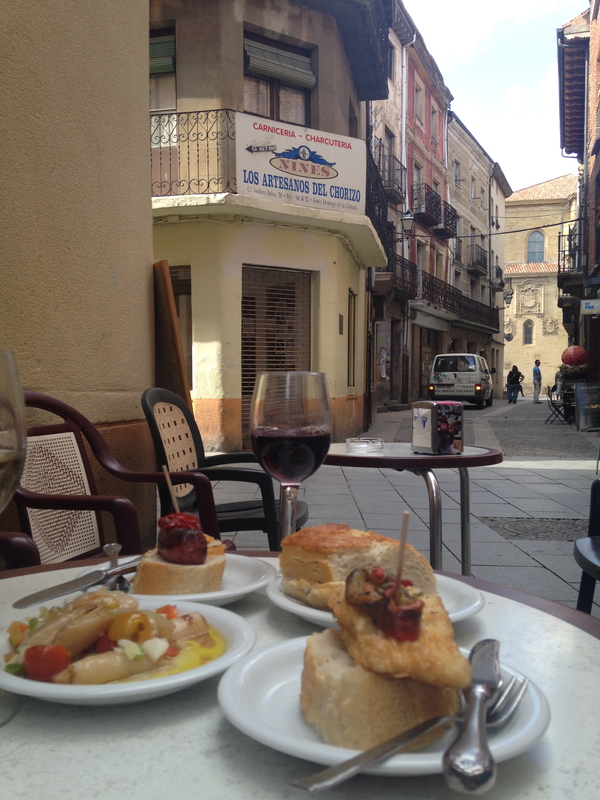 In any case- now- I’m craving those Camino foods again. I was on a long walk yesterday, and while it would be nice to always be thinking deep thoughts when I walk, or maybe puzzling through some piece of writing that I’m working on, the truth is that I’m often thinking about food. And yesterday I was thinking about Camino food, and all of the things I’m looking forward to having again when I return to Spain. This isn’t going to be a comprehensive post about the food of the Camino or all of the unique and wonderful things you can find in the north of Spain (although it will be picture heavy… wow, did I take a lot of photos of my food!). I certainly got to eat some incredible food while on my pilgrimage, but there was a lot I missed, as well. I’ve always been satisfied with simple food, so for the majority of my Camino, I was happy with coffee, bread, wine and a pilgrim’s menu. Sometimes I read blogs about what other people eat on their Caminos and I wonder: were we walking the same path? Where in the world did they find that incredible meal? 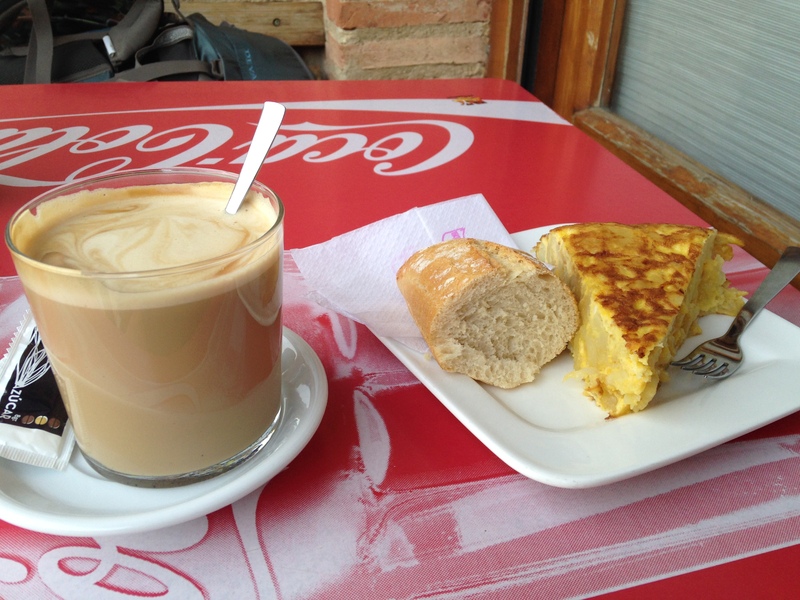 Here’s a run-down on my Camino eating routines: I’d wake up early and try to be walking around 6:30am. If possible, I would have a café con leche before I started walking, if I could find an open bar in the town I’d stayed in the night before. If that wasn’t possible, I would stop at the first open bar that I would come across, sometimes 30 minutes away, sometimes a few hours away (those mornings were tough). After walking for an hour or two, I would always eat something at that first stop: either tortilla (egg omelet with potato), a croissant, or toast. 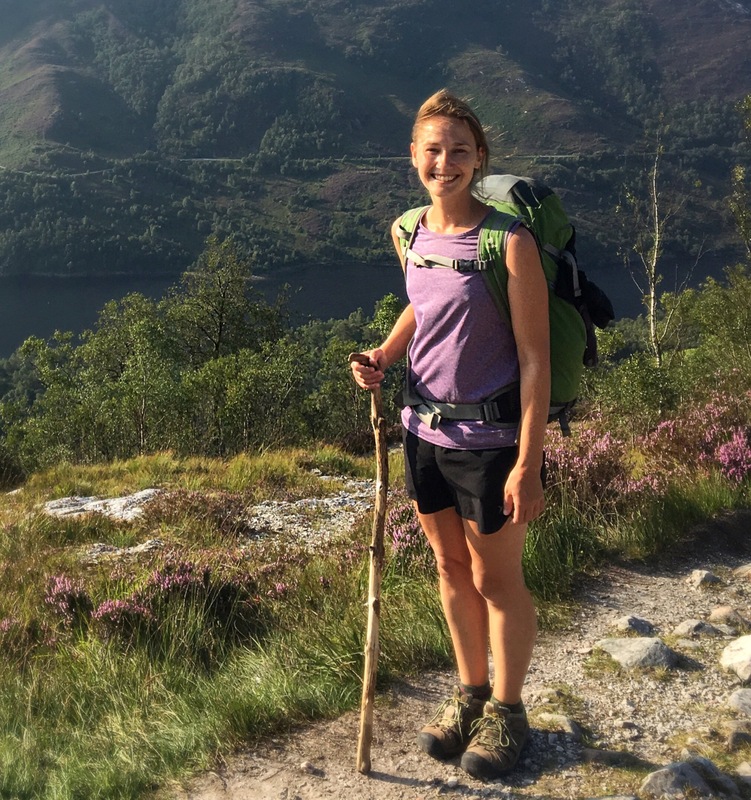 I’d walk for another few hours, and then sometimes stop for a second breakfast: sometimes just another café con leche, sometimes another tortilla or croissant or toast if the walk was strenuous or if I was hungry. If I didn’t have a ‘second breakfast’, I might opt for a pre-lunch ice cream break, on the really hot days. Lunch was nearly always a combination of food that I had stowed away in my pack. I know that some pilgrims stopped at a bar or restaurant for a sit down meal and a menu del dia (menu of the day, which is a great alternative to the pilgrim’s menu and usually offers a better selection of food). But I didn’t like taking really long breaks and preferred to have a sit-down meal in the evening instead. So I would cobble a meal together with whatever I could find in tiendas (shops) along the way: bread, cheese, ham, peaches, cherries, tuna, tomatoes, crackers/cookies. There was really nothing better than ripping off a crusty piece of bread and dipping it into a can of tuna drenched in olive oil, then biting into a juicy tomato and nibbling on a chunk of cheese. Basic stuff, but so, so good. In the late afternoons, I settled into a nice routine of finding a place to have a drink and/or some tapas. At first I would go with a glass of red wine, but somewhere along the way another pilgrim recommended a drink called ‘tinto de verano’, basically a summer red wine. It’s popular in Spain and like sangria, but simplified: one part red wine, one part carbonated lemonade (and usually served over ice). The perfect refreshment after a long day’s walk (for this non-beer drinker, anyway). And dinners were often a pilgrim’s menu (three courses, my choices were usually a salad, some kind of meat/fish with french fries, and ice cream, if available… along with bread and wine), or I would cook with friends if our albergue had a kitchen. 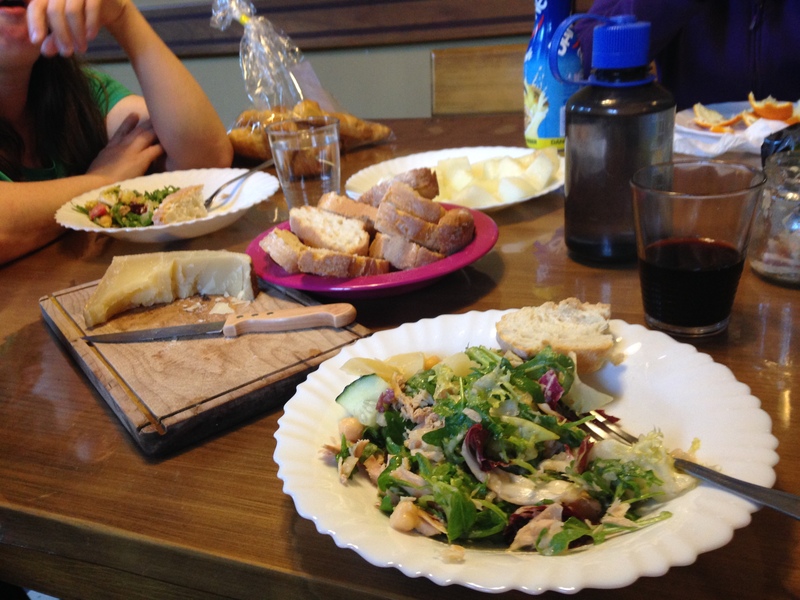 The nights of cooking were wonderful and economical, and more often than not we would throw together a big salad with all the vegetables we could find (fresh veggies can be hard to come by on the Camino, at times). There were highlights along the way, of course. Churros y chocolate at the Cafe Iruna in Pamplona. 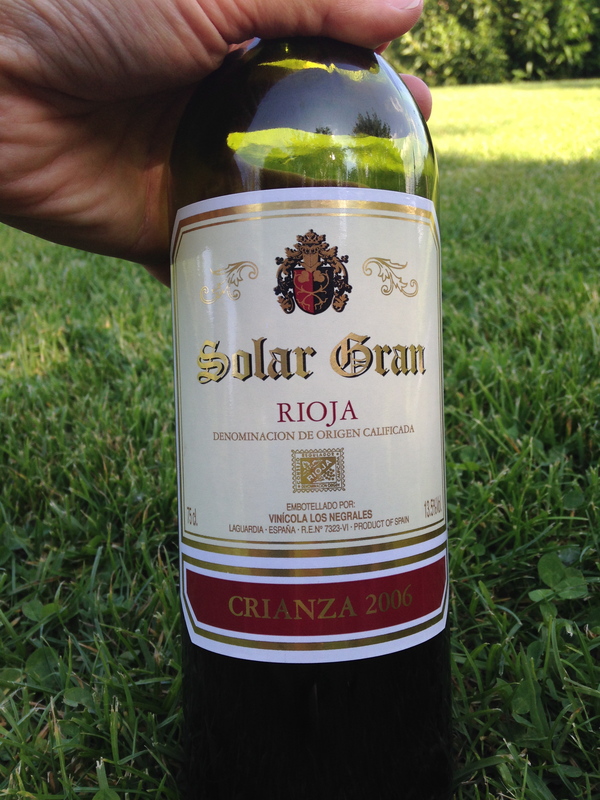 The wine in Rioja. A local man directed my friend Mirra and I to an amazing restaurant in Burgos, where we split a menu del dia and couldn’t stop raving about the quality of the food. 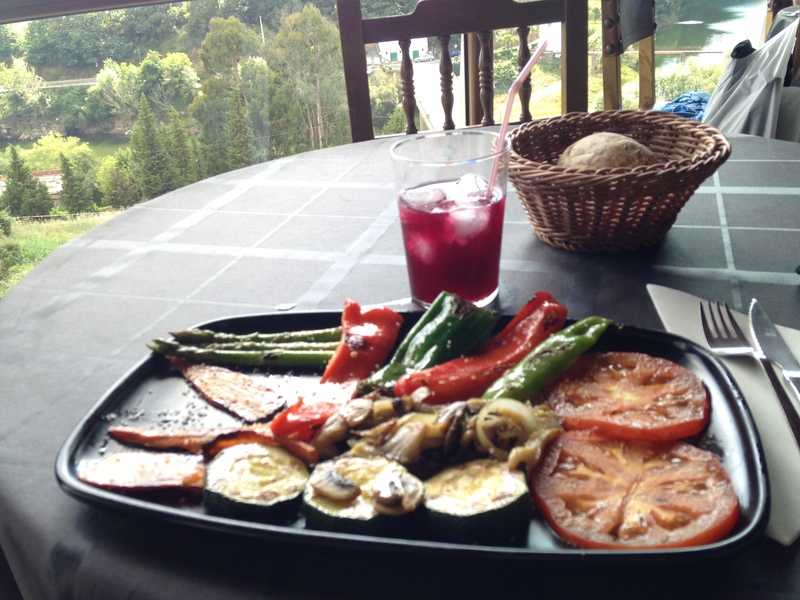 The best plate of grilled veggies I’ve ever had at the O Mirador in Portomarin. 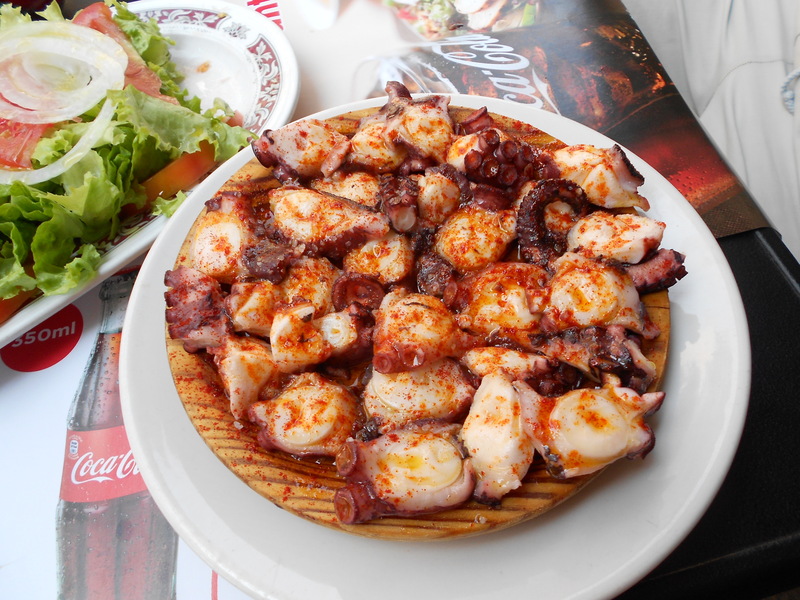 A dish of pulpo (octopus) in Galicia. 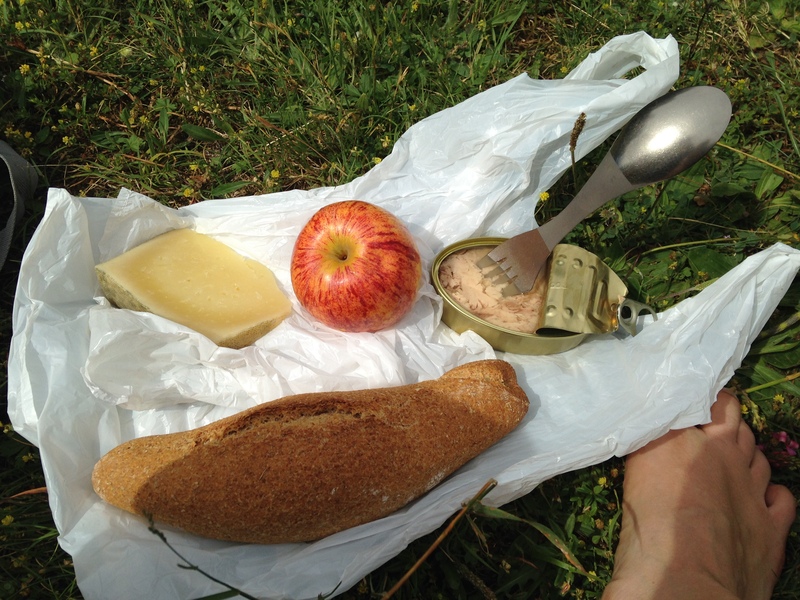 But hands down, the best meal of my Camino was, in some ways, the most basic. It was before I’d really tasted anything, it was at the very beginning. On my first day of walking through the Pyrenees, I went off the route and found an isolated little spot over a crest and tucked away from other pilgrims. I had bought a jambon-buerre (ham/butter) sandwich at the albergue in Orisson (so technically, this was a French meal, and eaten just before I crossed the border into Spain). And really it wasn’t about the food, it’s about what that meal represented: the first day of a big journey. Sitting, alone and free, somewhere in the Pyrenees mountains. Sunshine, a cool breeze, feeling excited at the start of a big adventure. 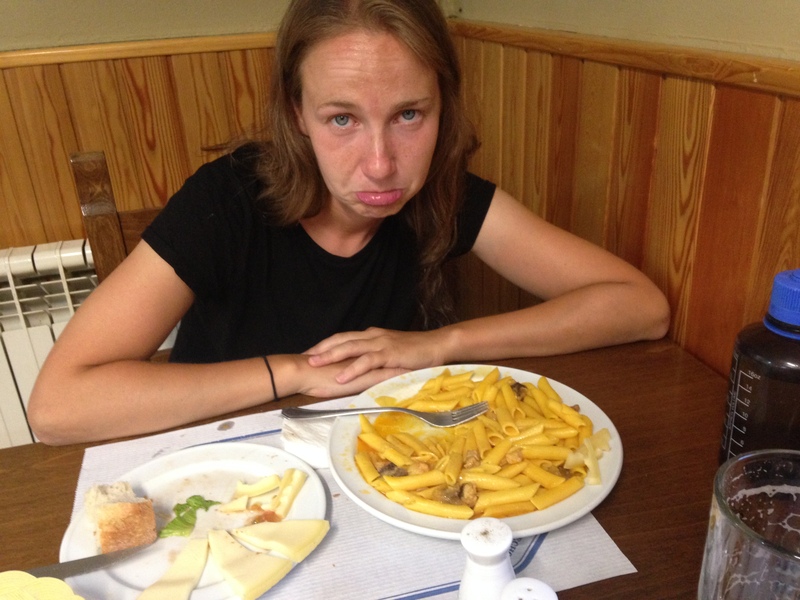 By contrast, the worst meal was at the very end of my Camino, 17km away from Santiago. I’d walked a longer than expected day, not ending until after 5pm (which was a very late day for me). I ordered a plate of pasta in the only bar in the “village” where I was staying, and I could barely eat it. The pasta was swimming among bits of unidentifiable meat in an oily “sauce”. Dinner ended up being sleeves of Oreos and a few glasses of wine. Here is the very unflattering photo of that meal, and my disappointment. Are there any standout meals from your travels that you can share? Any disappointments? Is there something (like a café con leche) that you dream about having again? Hi Nadine. I am with you on the café con leche. I wasn’t much of a coffee drinker until I tasted the Spanish version. My favourite meal was at Bar Deportivo, Navarrete: Rice, stuffed pimentos with a sauce, and beautifully presented. Of course, with Rioja. Oops, the photo’s didn’t upload as I hoped. I’ll try to post a link. I was definitely already a coffee drinker before Spain, and the cafe con leches only reinforced that 🙂 But I can see how they would convert someone! The meal you had in Navarette sounded amazing… that couldn’t have been from a pilgrim menu, could it? No pilgrim meal offered in that restaurant. They focus on traditional local dishes. Do I spy the “Uncle John” utensil? 🙂 My matching combination spoon, fork, knife gets used almost daily at work….it’s soooo handy to have! That cafe con leche looks so creamy and delicious, no wonder you’re craving them! And the pulpo…drooling here. 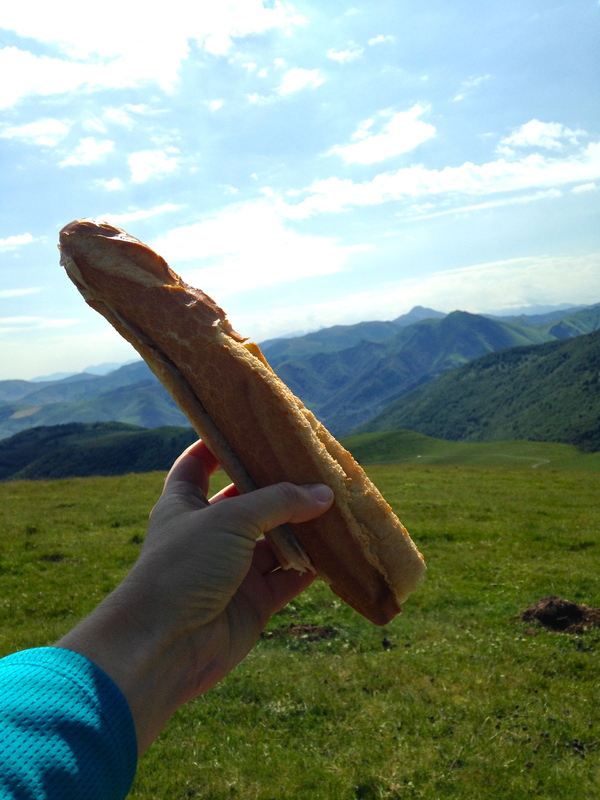 😉 Interesting post…I’ve always wondered how and what people eat on the Camino, but it seems very flexible. Terrible that your last meal was the worst. It should’ve been a wonderful meal to celebrate the end of an amazing accomplishment! Well, I DID get to have an incredible couple of meals in Santiago after I finished my walk… but the photo was from a night on one of the last days of walking, and it was truly a bad meal (and I’m not that picky, so that’s saying something!). Camino food is something special. When it’s no longer part of my daily routine, I think I will miss it. Especially those fantastic bocadillos!. Oh, camino food! In a restaurant, pulpo wins on the Camino Frances (with morcilla and callos closely behind), but the best meals I had were the communal meals in some of the albergues, when we’d all contribute something and cook together. And the food on my other caminos was actually better – a 4-course meal with an amazing fish and potato dish in Espelette (Baztan), the best grilled squid I’ve ever eaten in Oviedo (Salvador), in addition to the richness that is fabada, and a meal at Casa Herminia in Campiello (Primitivo) that ended with some sort of cheese and honey dessert that I’ve been craving ever since. Thanks for posting this. 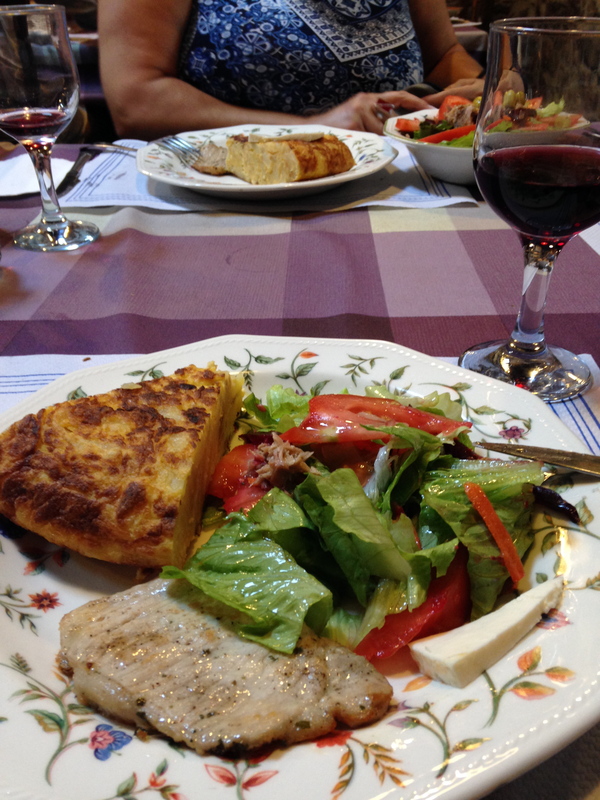 Meals on the camino bring back so many memories (and a need to hunt down some recipes)! 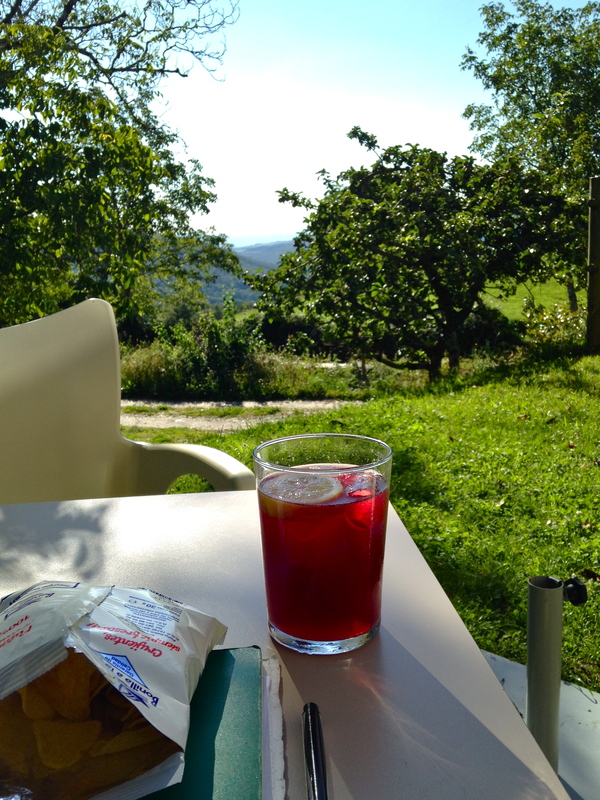 My routine was similar to yours (except cola cao instead of cafe con leche most of the time as I don’t really like coffee) 🙂 The best meal of the Camino for me was at my favourite albergue, about 5km outside of Leon. It was a ‘pilgrim’s menu’, but not at all like a normal one – when my friend asked to see the menu (in order to know whether we would book it or not), the hospitalero brought out a pot with the freshly selected cuts of meat in it! That, after it had been cooked was the main course, served with a selection of vegetables. Entre was chicken curry and rice, dessert was ice-cream and orange. As well as the food being hand-made (with the exception of the ice-cream) and delicious, I loved that the tables were beautifully set (candles and roses on each one! ), and the hospitalero and his family were so thoughtful and really wanted to make sure each of their guests had a great meal and night with them. I’m glad somebody mentioned that bar in Navarette. Simply the best tapas and pilgrims meal on the entire Camino. Absolutely glorious. I had the same experience of not being able to eat the pilgrim menus. But I reached that point on day 5. The bocadilla’s were so dry I couldn’t even put them in my mouth. I wanted to eat but physically couldn’t. The best meal I remember was in an albergue. Home cooked lentil and sausage stew. Another meal I remember was a Monte Cristo full of melted cheese! Ensalada completa had everything in it! Tapas in Santiago. 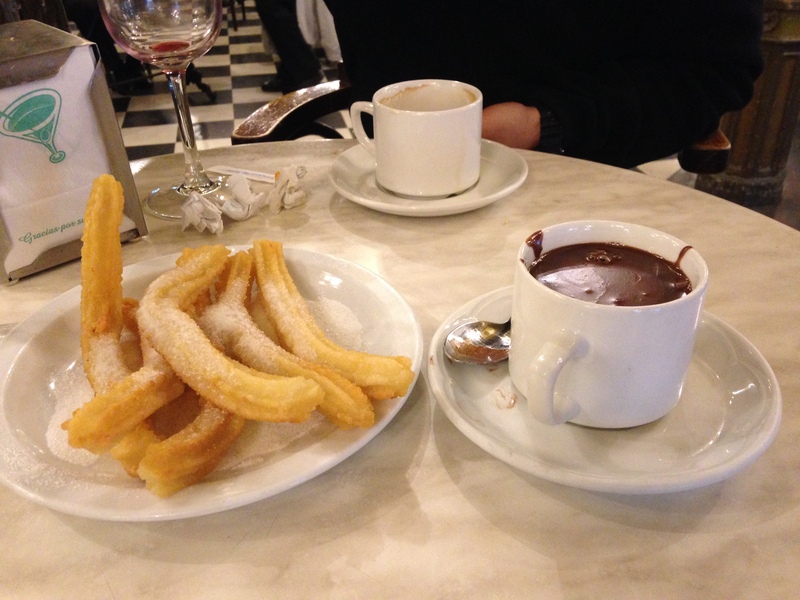 And of course, cafe con leche, chocolate croissants, churro y chocolate so great on a daily basis without guilt! Part of my problem was not understanding all the menu items and I can’t eat seafood, unfortunately. However, it was a good weight loss opportunity. We’re walking the Camino del Norte in September. I’m looking forward to it and hope I don’t hit the “bocadilla wall” this time.